A Money in the Bank qualifying match and six-man tag are set for next week's SmackDown. 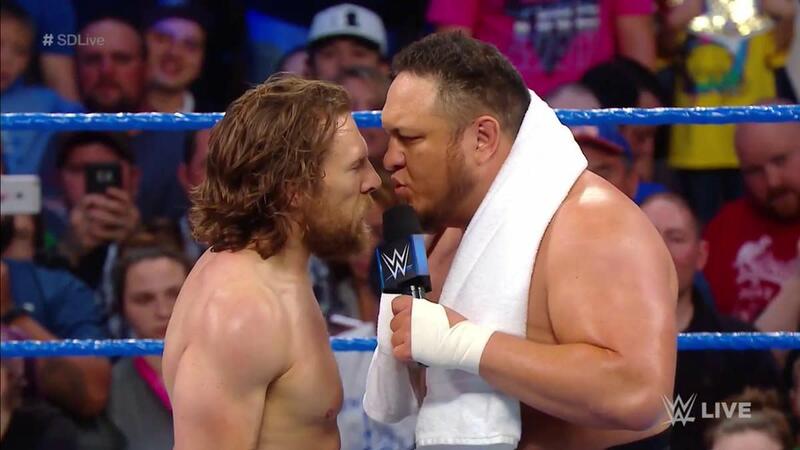 After defeating Jeff Hardy in their first-ever match against each other, Daniel Bryan will be facing Samoa Joe for the first time in WWE next Tuesday. The winner of that will be added to the men's Money in the Bank ladder match, joining Braun Strowman, Finn Balor, The Miz, Rusev, Bobby Roode, Kevin Owens, and a member of The New Day that has still yet to be announced. Joe vs. Cass was originally supposed to be the final qualifier, but Cass was pulled due to what WWE claimed was an injury. Cass was shown walking on crutches backstage tonight, and his storyline with Bryan could factor into next Tuesday's match. After being insulted by Cass last week, Bryan attacked him and wouldn't let go of a heel hook. Bryan submitting Hardy with the heel hook was also the finish of their match tonight. Big E, Kofi Kingston & Xavier Woods will be taking on The Miz, Cesaro & Sheamus in the six-man tag. WWE set that up when Cesaro and Sheamus got involved on Miz's behalf during his win against Big E this week.